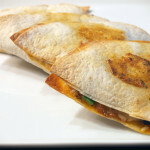 Recently, I ate a fresh mozzarella, basil and tomato panini that I thought was amazing. I wanted to recreate that classic sandwich when I received an email from Whole Foods: Fresh tilapia was going to be 50% off per pound, last Friday only. 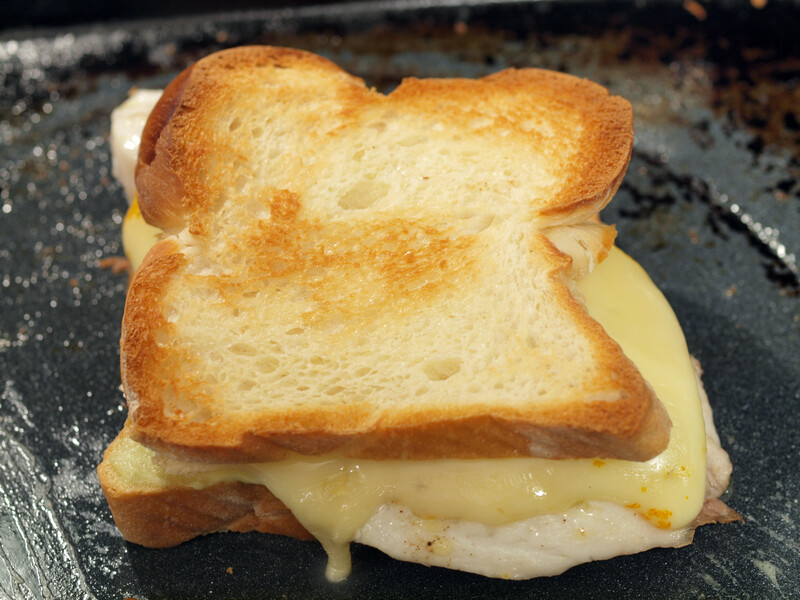 I then thought, “Hey, I have done a salmon grilled cheese sandwich, why not make a tilapia grilled cheese?” My mind was off and running thinking about what cheese, bread and accompanying ingredients would fit perfectly with the fresh tilapia. When searching through the cheese department, I had one word in mind: Mild. 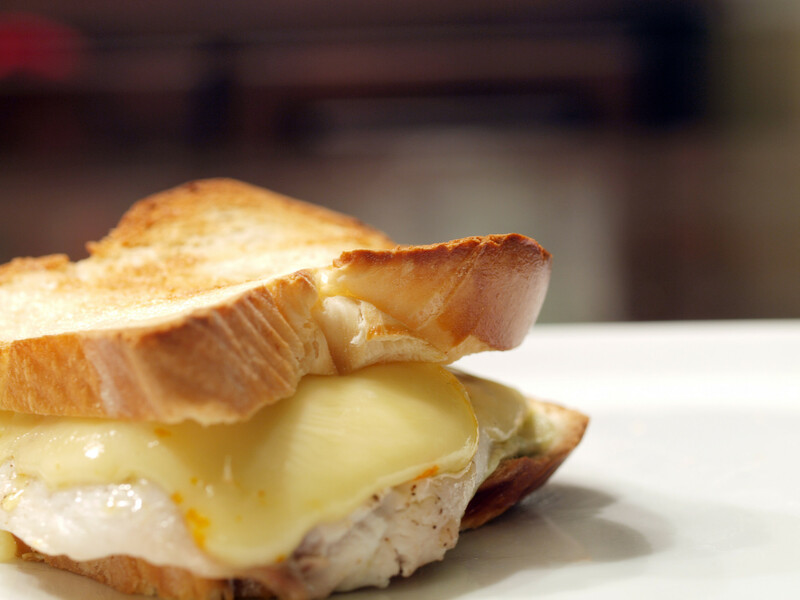 Tilapia is a mild, flaky white fish so I wanted to make sure the cheese did not completely overpower the fish. I quickly avoided cheddar, feta, and goat cheeses simply because I thought they might have too bold of a flavor. That is when I stumbled a sign that said mild. It was referencing Port Salut. It looked creamy, buttery and yummy. When I arrived home, it tasted exactly how I thought it would. Very yummy. SAFR Port Salut is smooth, delectable cheese made in the province of Brittany on the west coast of France. A region very similar to Maine, the countryside of Brittany is bordered by the ocean, boats and fish, and is steeped in coastal weather extremes. It has been said that Brittany is more influenced by England than its own motherland. It also happens to be great dairy territory – it’s responsible for 20% of France’s entire cattle raising, produces 20% of its milk and 33% of its butter. Tilapia has quickly become a favorite fish. It seems to be on sale often so I eat it often. When I saw that tilapia was going to be on sale at Whole Foods, I was excited. 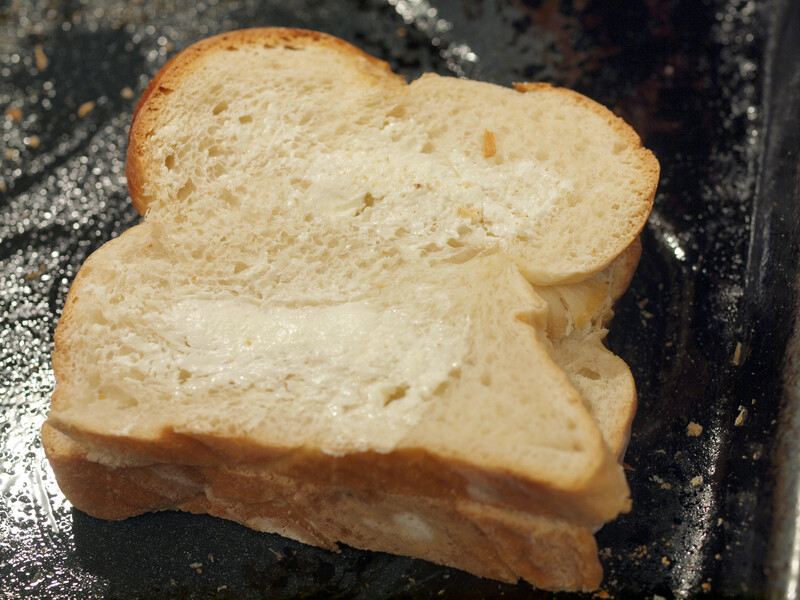 Then I thought about using it in a grilled cheese sandwich. I added a little salt, pepper and olive oil to the fish and cooked it for a few minutes prior to adding it to the grilled cheese. There is a fine line between done and well done so make sure to keep your eye on the fish as you are cooking it. You do not want it to get tough. After choosing the tilapia and cheese, I realized it need something else. I was not sure what, so I did a search for “tilapia aioli.” The sandwich needed a spread or sauce to accompany the cheese and fish. I stumbled on the recipe for Spicy Grilled Tilapia with Avocado Aioli. I ignored the ingredients for the actual fish and just focused on the aioli. I also decided to not use the chicken broth as I found it unnecessary and I was not able to use it because of the whole Kosher thing (meat + cheese = no). 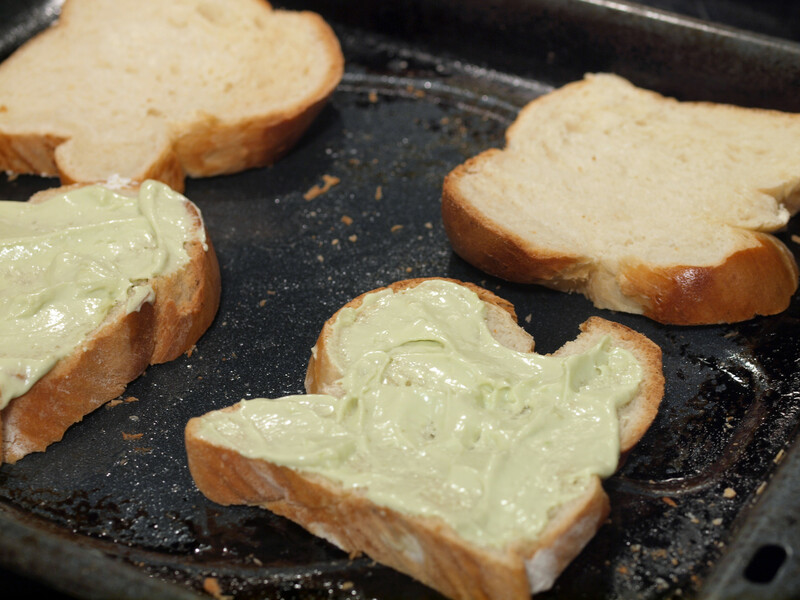 The making of this aioli was really easy and ended up being a great addition to the sandwich. 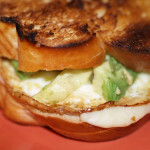 Avocado has a great flavor that only enhanced this grilled cheese sandwich. 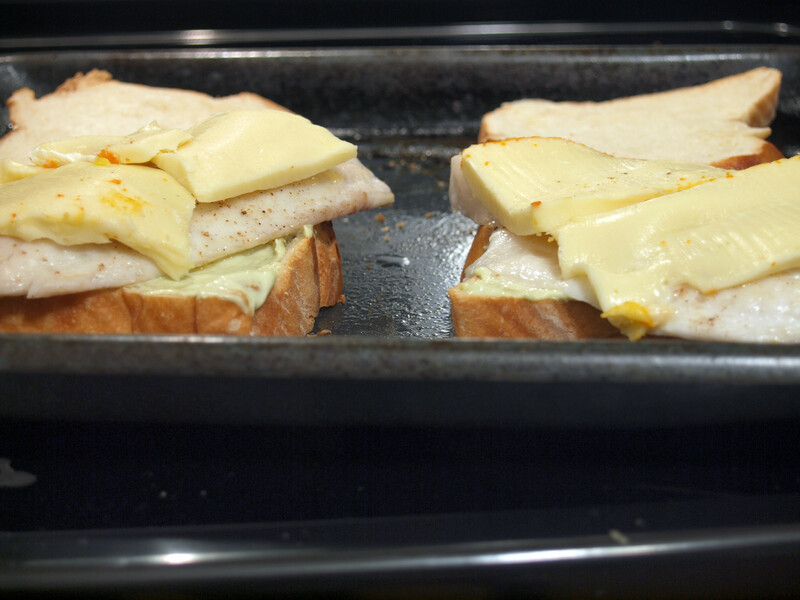 Sure, I used guacamole for the salmon grilled cheese sandwich and avocado for this tilapia grilled cheese sandwich. It was simply a coincidence. It continued to be a coincidence when I realized that I used challah rolls for the salmon and challah bread for the tilapia. 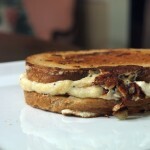 I felt like challah would be a nice, mild bread that would hold up well with the tilapia. It worked out well. 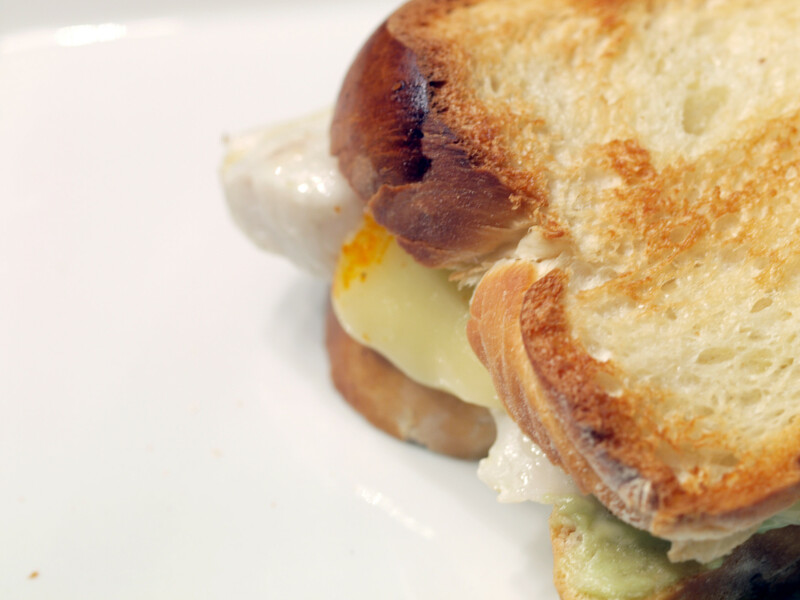 After first biting into this grilled cheese, I thought to myself, “This sandwich is good.” As I continued to eat, I tasted all of the flavors involved in this grilled cheese sandwich: the buttery cheese, flaky tilapia, yummy avocado, and crunchy challah. 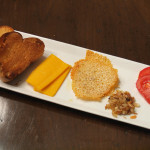 When all these individual tastes are combined, the grilled cheese has a unique flavor that I think really works. 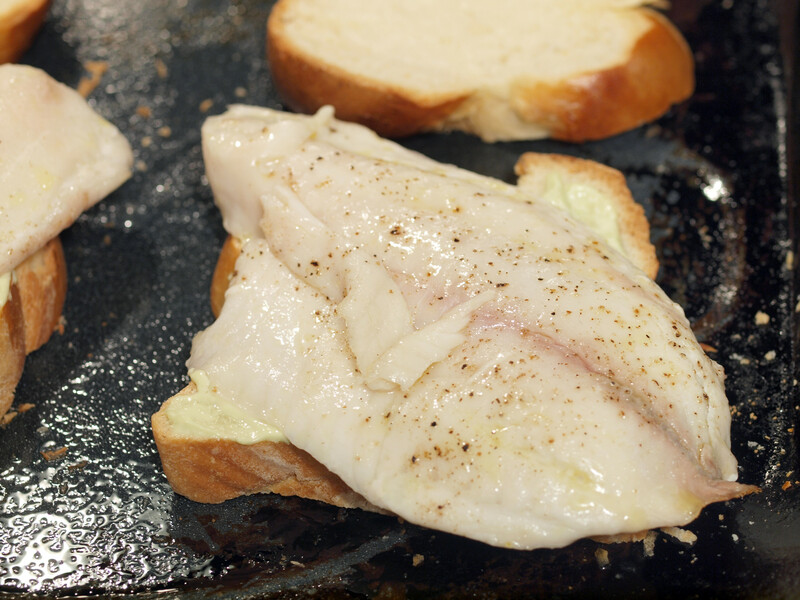 You just have to make sure that you perfectly cook the tilapia as tough little pieces can ruin any good sandwich. P.S. Today is my first day of in-kitchen courses. Please wish me luck…I am just a bit nervous.